A natural and national treasure, the Appalachian Trail (A.T.) is a stone’s throw from Adams County. The “most popular hiking trail in America” according to many, the A.T. is the longest hiking-only footpath in the world. Trees bearing the A.T.’s signature white blazes of paint guide 3,000 hikers, day-trippers, and adventure-seekers annually along 2,190 miles, 14 states, eight national forests, six national parks, and numerous state parks and forests—including several located close to Adams County. In fact, the halfway point of the entire A.T. is located in Pine Grove Furnace State Park in Cumberland County, just over the Adams County line. 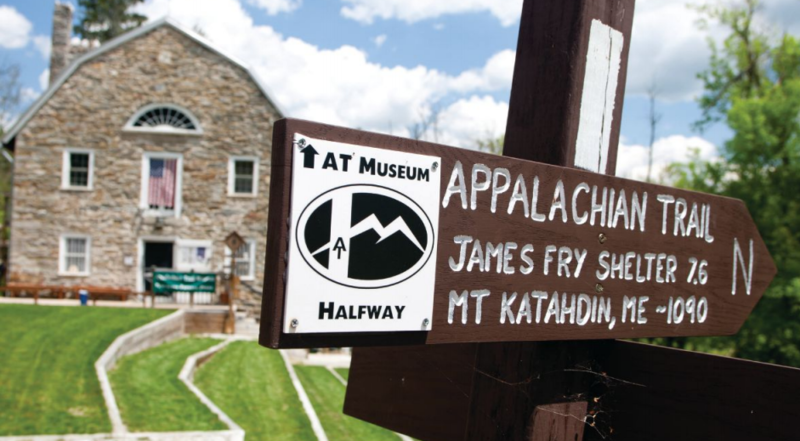 The Appalachian Trail Museum is located almost exactly at this midpoint, telling the story of the A.T. The museum is an excellent place to begin an Appalachian-themed daytrip and hike. “Like Pennsylvania being the keystone of the colonies, Pennsylvania is the keystone of the trail,” says Joe Harold, manager of the A.T. Museum. He says the museum serves several key goals: welcoming and supporting hikers at the half-way point of their journey, celebrating trail pioneers via fascinating displays and artifacts, and inspiring visitors to enjoy the trail. First proposed by Benton MacKaye in 1921, the A.T. was a vision that became reality thanks to numerous trail blazers. Similarly, the museum became a reality in 2010 thanks to Larry Luxenberg, a Pennsylvania man who hiked the entire A.T. in 1980 and subsequently researched and wrote the trail guide “Walking the Appalachian Trail.” “He kept coming across artifacts, and wanted to protect them,” says Harold, gesturing to A.T. memorabilia—landmark trail signs, journals, hikers’ boots, and more. Volunteers built and maintain the majority of the museum, housed in a historic grist mill. The stone structure was built around 1780 to provide wheat and flour for the surrounding area, known as South Mountain. In the center of the museum is an exhibit honoring Earl Shaffer, a York County native who earned the distinction of being the first person to hike the entire A.T. in 1948. It was a revolutionary idea at the time, Harold says, as no one had previously considered hiking the whole trail at one time. Now there’s a term for people who complete the trail—thru-hikers. It’s an experience Harold understands. The western Pennsylvania native retired from the Coast Guard in 2013. “I started hiking sections of the trail, thinking about my next job—I kept joking that I’d find a job on the trail, but I never thought I literally would,” he laughs. After volunteering at the museum for several months, he accepted a position as manager and is currently overseeing his third season. But it’s likely his final season, as he aspires to thru-hike the A.T. in 2017. “It’s become my life,” Harold admits. Riggs’ trail journal is filled with detailed accounts of the journey; he tried to post daily messages and scenic photos on Facebook so family and friends could track his progress. It was the fulfillment of a life-long dream. “I’ve always had a love of the outdoors,” Riggs says. “When I was in scouts, around sixth or seventh grade, I did a 100-mile hike from Valley Forge to Hershey and fell in love with backpacking. Then, in tenth grade, an 86-year-old man from my church completed the trail, and I said, ‘Oh my gosh, I’ve got to do this someday.’” It wasn’t until retirement that the opportunity presented itself. “I tell people I’m retired from teaching—not life,” he says with a smile. “Once you’re on the trail, what keeps you going are the people you meet,” Riggs says. “The views are incredible, the challenges are incredible, but it’s the people you meet—that’s the fabric of it. It’s a phenomenon—on the trail you have no economic status. It doesn’t matter where you’re from. The only thing you have in common is the trail—you’re going through the same travails and challenges, and it bonds you instantly; you become lifelong friends.” He has stayed in touch with 25-30 hikers via email or Facebook. There’s a tradition at the halfway point of the A.T. The “half-gallon challenge” encourages thru-hikers to eat one half of a gallon of ice cream in one sitting, at the Pine Grove General Store close to the A.T. Museum.